A lot has been written about the dangers of feeding kelp (seaweed) to animals (and humans). To quote Owens & Huntington in “What’s in a Label”, seaweed contains “lots of iodine and precious little of anything else”. They warn of iodine toxicity, amongst other things. Let me explain what nonsense that is. Firstly, kelp contains 46 minerals, 16 amino acids and 11 vitamins. Hardly “precious little of anything else”. Secondly, the level of iodine in a good batch of kelp is negligible. If fed correctly (15g per day) the level of iodine is way below toxic levels. Juliette de Bairacli Levy was the first to recommend seaweed as a nutritional supplement for animals, in the 1930s. Veterinarians of the day mocked her suggestion, but today she has been proved to have been correct. 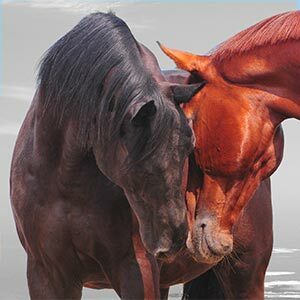 Kelp is now widely used and accepted as a valuable and inexpensive feed supplement for all livestock including horses and dogs. Kelp is: anti-inflammatory, demulcent, emollient, protective against radiation, anti-cancer, anti-tumour, antibiotic, immuno-stimulant, anti-viral and soothing to intestinal mucosa. protect the body against radiation. In dogs, it is recommended by Martin Zucker (The Veterinarians’ Guide to Natural Remedies for Dogs”) for cancer, heart disease, mange, old age, stool eating and thyroid gland regulation. All in all, kelp is an excellent all-round supplement. Just be sure to obtain from a reliable source (like The Herbal Horse and Pet ). Kelp grown in polluted water can contain unacceptable levels of contaminants. Having been in the business for 28 years selling seaweed products to many associated with livestock or pets , or fertilizer for building healthy soils , I can say that your information is certainly correct and timely , eapecially in this day of the dwindling nutrients in our soils .